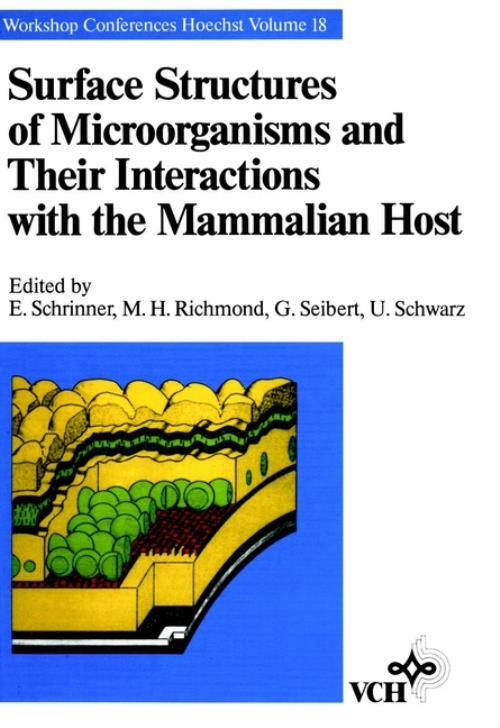 Surface Structures of Microorganisms and Their Interactions with the Mammalian Host Edited by E. Schrinner, M. H. Richmond, G. Seibert, U. Schwarz This book discusses the interactions that occur between the surface layers of microorganisms and the mammalian "host". Particular emphasis is placed on the field of microbial infection and pathogenicity, whereby yeasts, fungi and protozoa are considered in addition to bacteria. Other topics treated include bacterial endotoxins and cell wall degradation products. The twenty contributions to this book were written by a wide range of specialists from different countries. They offer an international and interdisciplinary compilation of current knowledge in this field. Bacterial Endotoxins: Properties and Structure of Biologically Active Domains (E. Rietschel, et al.). Naturally Occurring Murein Degradation Products (J. Holtje). Biology of Endotoxin, Hypersensitivity, Mechanisms of Host–Response and Metabolic Fate of Endotoxin (C. Galanos & M. Freudenberg). Biological Properties of Bacterial Surface Proteins: Type 1 Fimbriae of Escherichia coli (E. Beachney & S. Abraham). Bacterial Cell Walls and the Mechanisms of Inflammation in Experimental Meningitis (E. Tuomanen). Role of O Antigen in Mouse Salmonellosis (P. Makela, et al.). Pathogenesis of Inflammatory Arthritis Induced by Bacterial Peptidoglycan–Polysaccharide Polymers and Lipopolysaccharide (J. Schwab, et al.). Its Metabolism and Biological Activities in the Host (J. Tomasic, et al.). Pharmacological Properties of Cell Wall Degradation Products from Staphylococci (J. Verhoef). Genetics of Streptococcal Surface Structures Associated with Rheumatic Fever (M. Kehoe, et al.). Protozoal Cell Products and Their Effects on the Host (D. Mirelman). The Surface Layers of Candida albicans and Their Relevance to Pathogenicity (L. Douglas). Protein Interactions Essential for the Biogenesis of P Pili of Uropathogenic Escherichia coli (J. Tennent, et al.). Consequences of Specific Attachment of Escherichia coli to Gal proportional to 1 ––>4Galbeta–Containing Receptors (C. Eden, et al.). Adherence of Neisseria gonorrhoeae: How Little We Really Know (P. Sparling). Oxygen Radicals, Proteinases and Polyanions Modulate Bacteriolysis by Leukocytes (I. Ginsburg & M. Lehav). The Hopanoids, Prokaryotic Triterpenoids and Sterol Surrogates (M. Rohmer). B–Lactam Antibiotics and Host–Parasite Interactions (M. Limbert, et al.). A Clinical View on Host Stimulation and Means of Antimicrobial Therapy (A. Glynn).